Please note that this network refers to Ning 2.0 and is kept for archival purposes. As of March 2013, it is no longer possible to create a new Ning 2.0 network. To learn how to create a Ning 3.0 network, please visit this article. You can launch your very own Ning Network in three simple steps.Â Head over to Ning.com to get started. Click the “Get Started Now” button to begin your free 14 day trial of Ning.Â On the next page, you’ll select the subscription you’d like to start with.Â If you aren’t sure, click the link to read a full comparison of the plans under the “Which plan is right for me?” section.Â Once you know which plan you’d like, click its “Sign Up” button. On the following page, you’ll create your Ning account.Â When you’re finished completing all of the fields on that page, click the “Sign Up” button.Â If you already have a Ning account, click the blue “Sign In” link. You’re all ready to start creating your new Ning Network!Â You’ll see the plan you’ve chosen listed at the top of the next page.Â Click the box in the “Your Plan” section next to the monthly fee you’d like to pay. One is for a monthly service, while the other is a discounted monthly fee for an annual service.Â You’ll begin your subscription 30 days after your network has been created.Â If you’d like to pick a different plan instead, click the blue “Change Plan” link on the right side of that page. In the “Social Website Information” section, choose a name and a URL for your network. WhileÂ the name you give your social website can be edited later on your network, the web address cannot be changed once the Ning Network is launched and will be your network’s URL from here on, unless you choose toÂ map your own domain to it. In the “Choose Your Payment Method” section, select whether you’d like to use your PayPal account or a credit card for your plan subscription.Â If you select PayPal, you’ll be directed to enter your PayPal.com information on the next page.Â If you’ll be using a credit card, fill out all of the required information and click the “Complete” button. Note the receipt in the bottom right hand corner, letting you know what subscription you’ve selected, and when your free trial expires. On the next page, you’ll be on yourÂ brand newÂ Ning Network.Â Here, you’ll be able to set up your network’s details.Â Start off by selecting your network’s country, language, category and privacy setting. You will also be prompted to provide your phone number here. Your information won’t be shared, and leaving this field empty will not hinder the process. Click the “Save” button when you’re ready. 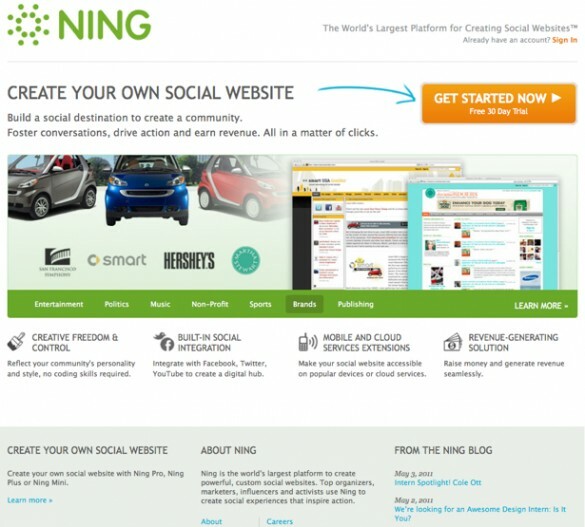 Congratulations!Â You now have a new Ning Network and will see a variety of options to get started. Enjoy!